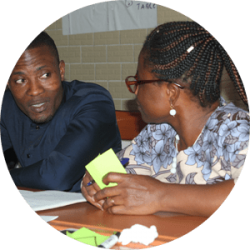 In late 2018, TransformELT began work on a pilot project in Senegal and Cote D’Ivoire to develop English Clubs for secondary schools in the region. An FCO-funded project, and working in partnership with the British Council, this is part of a larger programme in the region – ‘English Connects’. English Clubs are very popular in West Africa as they offer an opportunity to practise and develop English language skills in an enjoyable way. The focus is on fluency and using English in a natural way. The overall aim of piloting an English Club support toolkit for secondary school teachers is to increase learners’ confidence and ability to use English by providing teachers with additional resources for club activities. Also to assist teachers in developing local support communities so as to motivate and encourage them in enacting this voluntary role. Helen Callanan, Lead Consultant, carried out an initial inception visit, focusing on meetings with club leaders, focus groups with club participants and separate focus groups with students who do not attend an English club. A week-long series of workshops followed, in which participants generated ideas for activities, demonstrated them through micro-teaching and received peer and consultant feedback on them. The resulting ‘toolkit’ was loaded onto SD cards and delivered to a selection of schools and English clubs across the two countries. There then followed a period of trialling and observation before a fully revised toolkit was presented at the end of the pilot, ready for distribution to all English Clubs, together with recommendations on mechanisms for wider ‘rollout’ and future development and sustainability. The long-term aim is that through the ‘English Connects’, UK visibility will be increased across the region, improving UK access and making us more ‘relevant’ to senior policy makers and influencers. By working together as ‘the UK’, we aim to maximise impact and influence in support of wider development objectives in the region.